Do businesspeople use search engines *other* than Google? How does your rank affect your clicks? When in the buying cycle do execs turn to search? How critical is copywriting to grabbing clicks? ... how business purchasers use search engines to look for your products and services. Thanks to your help, that marketing research gap is now filled with reliable, useful data. Last month we asked our readers to forward a request to non-marketing department colleagues to take an online survey about their search use. Almost 1,500 business execs and IT pros took the survey. Our research partners at search marketing firm Enquiro sliced and diced the data which included eyeflow patterns and real-life search activities (not just Q&A about activities.) This morning they published a formal study PDF with 28 tables and charts. "Google is not the only search engine," we've been advising marketers for the past year or more. "You may use it but that doesn't mean all your prospects do. You need to make sure your search campaigns are found everywhere so you don't miss great prospects." Well, according to these study results we were wrong. Although Google only has a 36% share of the total online search usership according to comScore data from earlier this year, when it comes to b-to-b users, Google is overwhelmingly dominant. 82.9% of surveyed business users said Google was their search engine of choice. This rises even higher as you go up the executive foodchain. 86.9% of highest income business users prefer Google. In our experience most B-to-B marketers are overextended in terms of time and resources. So, this data would suggest that your best bet is to stop spreading yourself thin, and concentrate on making your Google campaigns perform as well as possible. Work on your bidding tactics, optimization, and of course very "lite" (clean-and-simple layout, few graphics, concise copy) landing pages that Google users anecdotally tend to prefer. 54.6% of respondents said they used search 30-90 days prior to authorizing or making a particular business expenditure. This means search is your first line of defense near the start-mid-level of the sales cycle. Then use your landing page to grab as many prospect registrations as you can. And switch some of your lead acquisition budget over to nurturing campaigns to educate and warm your leads until they fall like ripe plums into your sales team's hands. Start viewing search as a combo of education, awareness, and mid-cycle lead gen. Stop basing your success metrics on immediate or close-to-immediate sales. By the time the prospect is red-hot, they are probably *not* using search to look for offerings like yours anymore. They've already got a short-list and they're going direct to those people's sales reps.
We have to ask the question, why, when the overwhelming majority of clicks are going to organic listings are US marketers spending $3.3 billion on paid ads this year compared to $285 million on search optimization services? Your budget is out of whack. Optimization may be a nasty, technical, ever-changing pain in the you-know-what, but that's the ballgame. You gotta play to win. Being ranked in the top three is important for organic results - links in these positions get 59.7% of all organic clicks. Top ranking for a paid search ad is even more critical, with 51% of total paid ad clicks going to that very top spot, only 24.2% to number two and 9.8% to number three. That said, you can use copywriting to stand out and get more clicks than perhaps your position strictly deserves. Turns out that search users (especially Google users) have A.D.D. in a big way. Their eyes skitter quickly across the page. 27% quickly scan looking for words to jump out. If nothing does they leave or try another search immediately. An additional 57% scan quickly, and if they find nothing obvious to click on, then they actually settle down and carefully read titles and descriptions. So, if your title, description, or URL has a word or words that are expertly crafted to catch that skittering eye and tell it "Here! This is the right place!" you can win the click up to 84% of the time. In our experience most B-to-B sites do a particularly bad job of copywriting the descriptors that show up in organic rankings. This is an area you could beat your competitors in -- and not spend much money doing so. That's why for 2005, we advise you to invest in your own Web presence first before outward search campaigns. Make sure your site design pleases incoming prospects so they don't go to search engines; optimize your pages so you get more of those lovely (free) organic listings; and, tweak your campaign landing pages so Google users will convert at higher rates as registered prospects. Then go out and have fun with your paid search ad campaign. 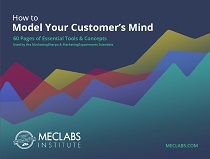 Best wishes, and thanks again for your support in creating this useful study to help the B-to-B marketing community.